"We need to know what's inside." "So do I." Whoaaaaa. Paramount has released a new full-length trailer for the latest sci-fi film from Alex Garland (of Ex Machina), who is adapting from Jeff VanderMeer's series of novels. Annihilation stars Natalie Portman as a biologist who travels with a group into a special place known as "Area X" where the laws of nature don't apply. This trailer shows us a bit more of "what's inside" and damn does it look trippy and scary and very mesmerizing. Also starring Jennifer Jason Leigh, Gina Rodriguez, Tessa Thompson, Tuva Novotny, and Oscar Isaac. I am so very excited for this, mostly because I trust in Garland to bring us some of the best cerebral sci-fi around. And this looks wildly unique. You can also still watch the first teaser trailer for Garland's Annihilation here, to see even more footage. 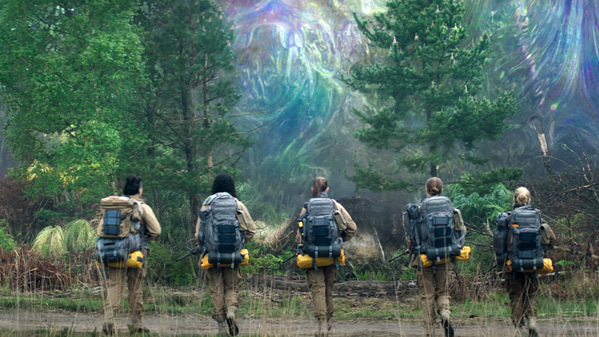 For more info on the film, follow Annihilation on Twitter @annihilationmov. Or visit their official Facebook. A biologist (Natalie Portman) signs up for a dangerous, secret expedition where the laws of nature don't apply. Annihilation is directed by acclaimed English writer/filmmaker Alex Garland, director of the film Ex Machina previously, and writer of the scripts for The Beach, 28 Days Later, Sunshine, Never Let Me Go, and Dredd. The screenplay is also written by Alex Garland, adapted from Jeff VanderMeer’s best-selling Southern Reach Trilogy. Paramount will release Alex Garland's Annihilation in theaters everywhere starting February 23rd, 2018 early next year. We'll be there. How does it look? What do you think of this trailer?